This week, Merlin finally brings an end to the Evil Gwen storyline, after weeks of confusion. Not to mention, dragons, cross-dressing, Emrys and the awful knowledge that, yes, the series ends at Christmas, so anything could happen as we build to a climax. Sounds like With All My Heart must be good, doesn’t it? As ever, watch on iPlayer first if you don’t do spoilers. I must admit, impatient though I was for the Evil Gwen story to finally end, I was disappointed that we cut straight to Arthur knowing the truth. The scene where Merlin has to convince him his wife is a traitor surely quite an important one? But this was a hectic episode, even by Merlin standards, so I can’t blame them for wanting to get the hell on with it. We had a heroic Emrys confronting an elderly witch – excellent make-up job on her, by the way – and then the big quest to restore Gwen’s soul. Oh, but not before the comedy wheelbarrow scene, which was excellent. But nowhere near as funny as Merlin’s latest ridiculous secret identity. Colin Morgan once again under heavy make-up as elderly she-Merlin, camping it up ludicrously. Not sure I’d want this gag broken out every week, it’s a bit silly even by Merlin standards, but did make me laugh. They managed a real sense of importance with the last third of this episode, bringing all the plots together: Evil Gwen, Mordred, Morgana, Aithusa. In fact, if the Evil Gwen storyline accomplishes nothing else, it fed back in to the much more interesting Mordred subplot, which will hopefully stay at the forefront. The Gwen arc itself suffered badly from a strange desire to make us believe she had “really” turned, yet writing her much too unrepentantly evil for that. The ambiguous version of this arc would’ve required a degree of subtlety the Merlin writers don’t seem to possess, so it’s probably better for everyone that it’s finally over. To be honest, the conclusion to this episode was sudden, considering it’s resolving the last four episodes of plot, but I’m so glad it’s finished, hardly going to complain. This leaves us with a clear run of four more episodes left to tie up… oh, just the entire show. Anyone want to place some bets on when Arthur will find out the truth about Merlin? 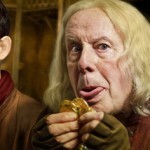 I reckon the penultimate episode, shortly after Gaius inevitably dies. Well, considering Colin and Katie said that the fans would be pleased and satisfied with the finale I have some hope that they will present us a reveal under the Christmas tree. I think one can only but hope! Considering they’ve confirmed the finale for Christmas Eve, it’s going to be a pretty miserable Christmas for a lot of Merlin fans if they don’t. I personally am just hoping it’s funny.